Are you living the moment if you’re always behind a camera? 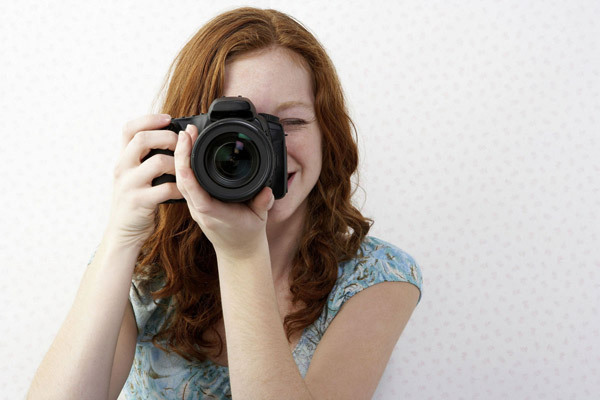 Are you afraid of missing a picture-perfect moment with your kids? You can try to capture every moment on film, or you can turn your attention to your children, and record their miraculous moments in the photographs of your memory. Look this way and say cheese! I never understood those camera people. You know, the ones who can’t leave the house without a 35mm hung around their neck, or a video recorder glued to their palm. They make their way through the world with shutters clicking and tapes whirring, recording for posterity the every inhale and exhale of their friends and family.I just didn’t get it. When on earth would I have the time — or the desire — to sit down and view little Susie’s mid-season soccer game, or an hour’s worth of last summer’s dolphin show at Sea World? When I barely have time to flush, why would I choose to relive those events, blow-by-blow, when I had my fill the first time around? Then I had kids, and suddenly I understood. In the last three years, we’ve purchased a digital camera, a point-and-click and a palmcorder, and now we’re considering an upgraded model. I carry disposable cameras the way people tote Kleenex: One in the car, one in the diaper bag, one in my purse. I’ve got extra memory cards stashed around the house in easy-to-grab places. You just never know when the little ones are going to do something cute, and woe is the mother who misses that picture-perfect moment!With two children, the temptation to record each smile is even stronger. It seems like just yesterday I came home from the hospital with my little pink bundle in tow… and now it’s already time to pack up Kinsey’s doll-sized summer onesies and sundresses. I blink and she’s rolling over; I turn my back for a second, and it’s time for her two-month checkup. Meanwhile, Benjamin’s starting preschool, learning to read, and outgrowing shoe after shoe as he sprouts upward and onward, away from me. I wish I could capture every second of their childhood on film. I want to hold onto the look on Benjamin’s face the first time he connected baseball bat to ball and sent it flying back at his ecstatic father. I want to relive the time he convinced us he was ready for “big boy” underwear and, despite his promises, made a puddle in line at the New England Aquarium.I want to leaf through Kinsey’s infancy, page by page, and recall each toothless grin, each moment of holding her in my arms as she slept, eyelashes resting against the creamy-smoothness of her round cheek. I even want to revisit the bad times — the sleepless nights because of monsters in the closet, the cranky, rainy afternoons — and the ho-hum times, too. I know there will come a day when I’d give everything I own for one more family dinner, one more chilly morning with all of us cuddled together, sharing a single quilt in our big bed. If I could only hold on tight enough, take enough five-by-sevens, maybe I’d be able to bring it all back. Is it too big a price to pay? But there’s a cost that comes with viewing the world — and my family — solely through the lens of a camera. I’ve discovered that when I’m busy recording life, I’m not living it. I become so concerned about the lighting and how much film/memory card and battery life I have left that I become distanced from what’s going on right in front of me. I become an observer, not a participant.I used to think empty baby album pages demonstrated a deficiency on my part — that there was no excuse for not taking the time to fill my children’s books with the important milestones of their youth. Now I know how false that is. Life isn’t lived between the pages of a scrapbook — and even the highest-quality photograph or home movie is only an imposter. No reproduction can capture the true heart-filling energy and emotion of my son’s laughter or my daughter’s first smile any more than I can squeeze their souls into a frame to set on the mantel.So I’m traveling lighter these days and leaving the cameras in their packs. I still wish I could record each day of my time with my children, so in my twilight years, I could page through the albums, looking once more at our lives together.But instead, I’ll have something more precious: The photographs that don’t ever fade — the ones taken with my eyes and stored in my heart.